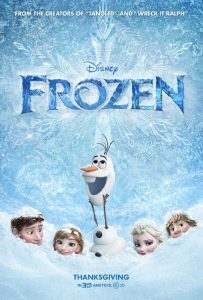 This weekend’s box office sees “Frozen” move up from second to first place in rankings, as the hit Disney film made $31.6 million, for a total take to date of $134.3 million. While they both declined this weekend, “Frozen” managed to beat the “Hunger Games” sequel “Catching Fire,” which made $27 million (for a total of $336.7 million). Meanwhile, “Thor: The Dark World” came in at fourth place for $4.7 million, earning $193.6 million to date. “The Best Man Holiday” fell some notches from fourth to eighth place, adding $2.7 million for a total of $67.2 million. Like last week, the top two films at the box office star female characters.